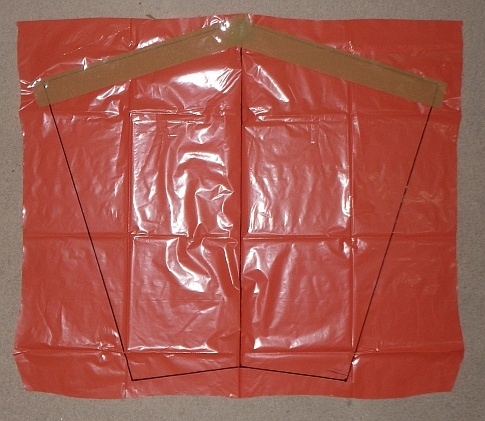 Learn how to make a Soft Sled kite with these easy-to-follow instructions. Fully illustrated with large photographs, every step of the way. Don't be too concerned about the length of these instructions. The steps are easy, hence this Sled will soon come together. 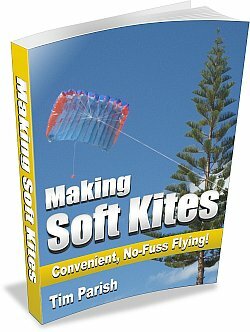 Consider the Making Soft Kites e-book if you prefer to work offline or from printouts. It's a PDF file download. This Sled is the first of the 5 Soft designs in there. You can attach a tail at each lower corner if you want to, just for looks. Or even a single tail from the middle of the trailing edge. The kite does just fine without them, as can be seen over there in the photo. We don't hesitate to take out our Soft Sled out to inland fields where the air is a bit rough at times. It copes! Like all Sleds, it's very convenient to fly - just attach the line and up it goes! This kite suits fairly light to fresh winds. That is, from around 8kph right up to 35kph. This could vary a little depending on exactly what kind of plastic and tape you are using. The kite described here will need fairly heavy bag plastic. 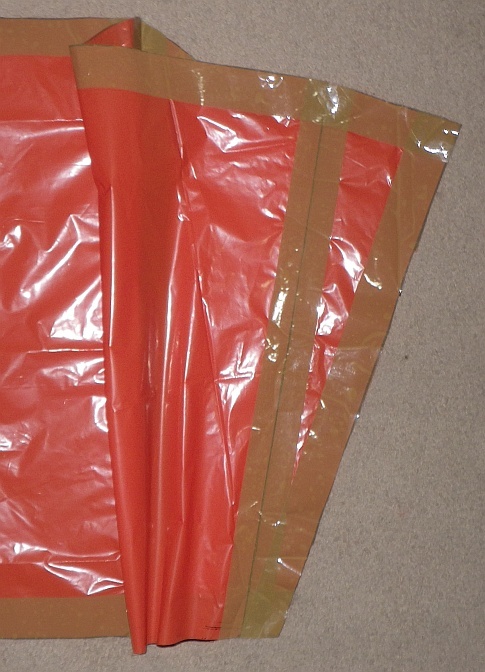 The orange plastic in the photos is a high-strength garden-bag. 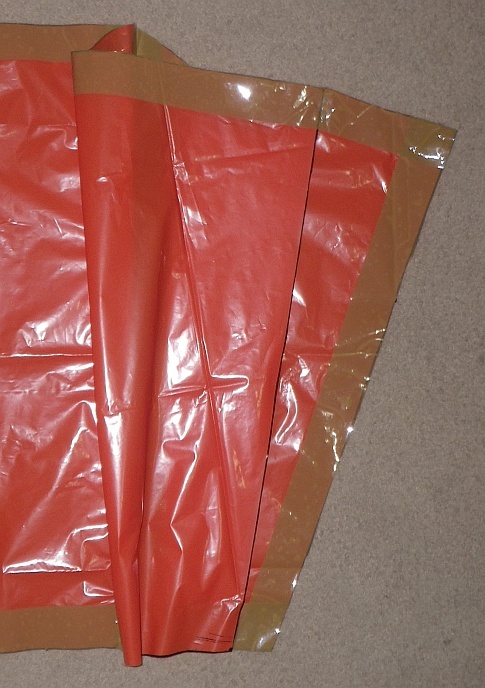 Another alternative would be painters' heavy-duty drop-sheet plastic. 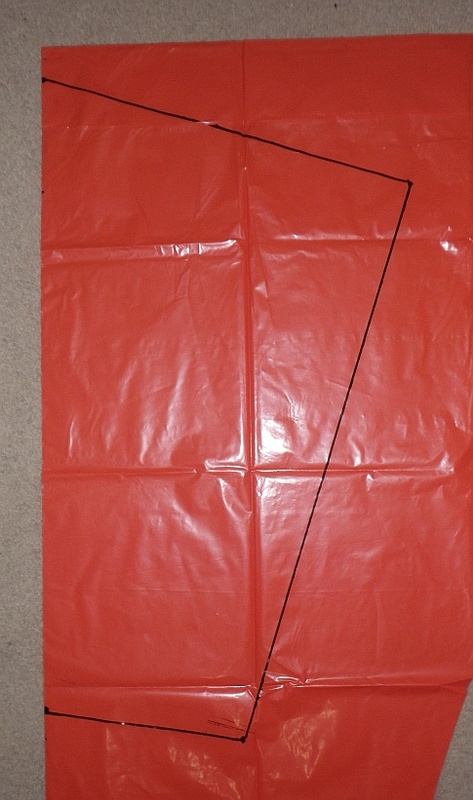 If very thin and flimsy plastic is used, your kite might tend to fold up in the air rather than fly. If the plastic is hard to see through, it's probably thick enough! Place your plastic bag flat on the floor. In the case of plastic sheeting, fold it in half from left to right and run a sharp, straight crease down the left hand side. Starting from near the top-left corner, measure and mark dots on the plastic. Just follow the arrows marked on the photo. I've high-lighted the dots in yellow. Judge the horizontal and vertical directions by eye. If you're careful, there's no need for a T-square. The slight slope near the bottom of the photo is just the camera distorting the image. The arrows should be horizontal! Take your ruler and connect the dots with the black marker pen, as shown in the photo. Flip all the plastic over and trace over all the black lines showing through the 2 layers of plastic. Hint: If it's too hard to see through the plastic, just lay it up against a window. The light from outside should show up the lines easily. Mark dots at all the corners, and then connect the dots using pen and ruler. 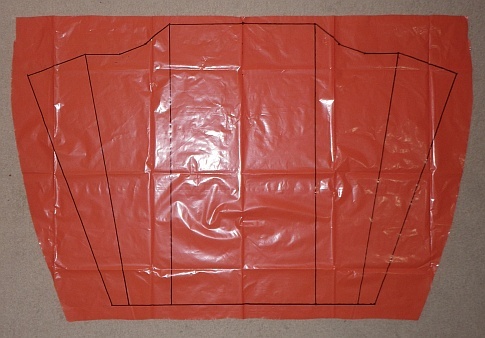 I know what you're thinking - why not just rule one set of lines and then scissor-cut the two layers of plastic at once? Answer - it's very easy for one sheet to slip against the other while cutting, with horribly inaccurate results! Do it my way and your kite will fly perfectly, the first time. 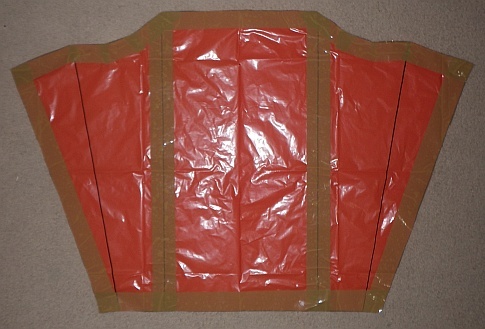 Open out the plastic to show the complete sail outline, as in the photo above. 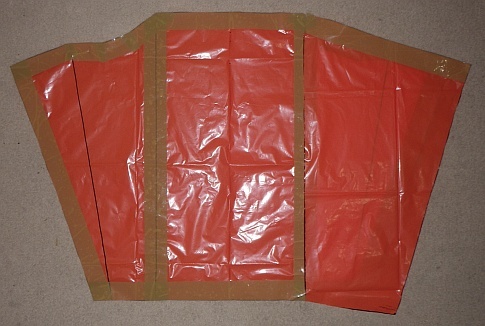 If using a bag, you'll first need to cut off the top, bottom and right hand sides of course. So you can unfold it right to left. That's what I've done in the photo above. 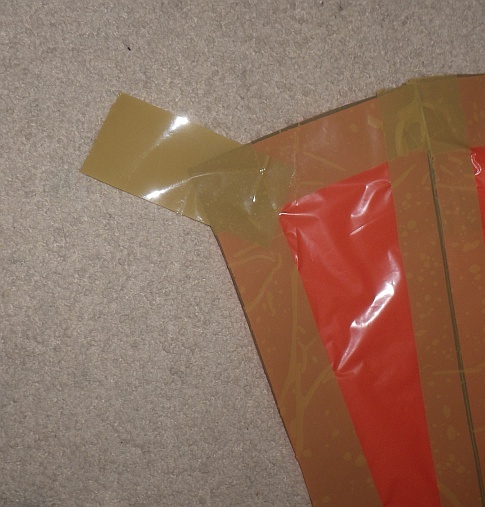 Lay packing tape along the marked lines as shown in the photo above. Around the outside of the sail, let the tape overlap the black lines by about a finger-width. Leaving most of the tape inside the outline. 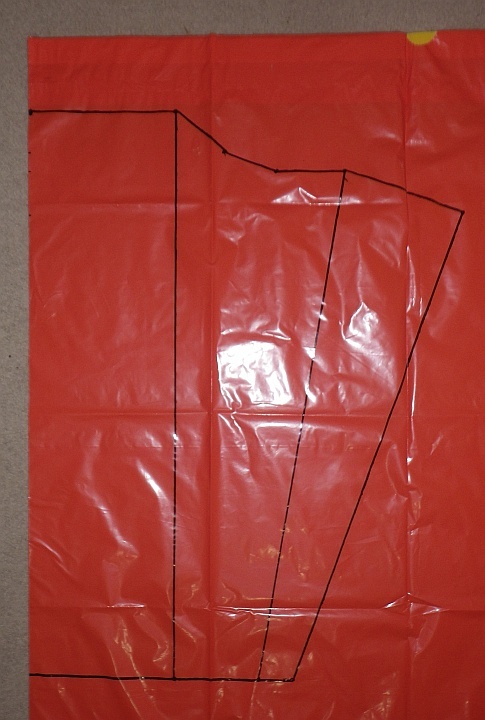 For the two central lines drawn down through the sail, try to center the tape's width over each line. As close as you can get it by eye! Hint: It's a lot easier to use packing tape when the roll is sitting in a dispenser. Pull tape out to length and then tear off, just like sticky tape. Now flip the plastic over. Lay packing tape along just the two lines closest to the center of the sail. See the photo above. Take your scissors and cut all around the outside of the sail, along the black lines. When you are finished, it should look like the photo up there. 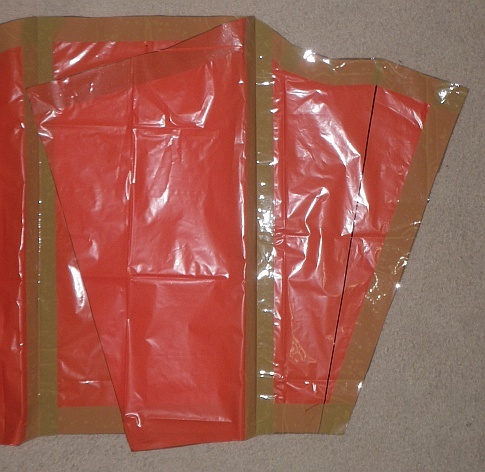 The cells are the inflatable pockets that do the same job as rods of wood or fiberglass in a simple sparred Sled. Hence some call this kind of soft Sled a Ram-air Sled. The air rams in the front opening, helping to keep the cell rigid while in flight! 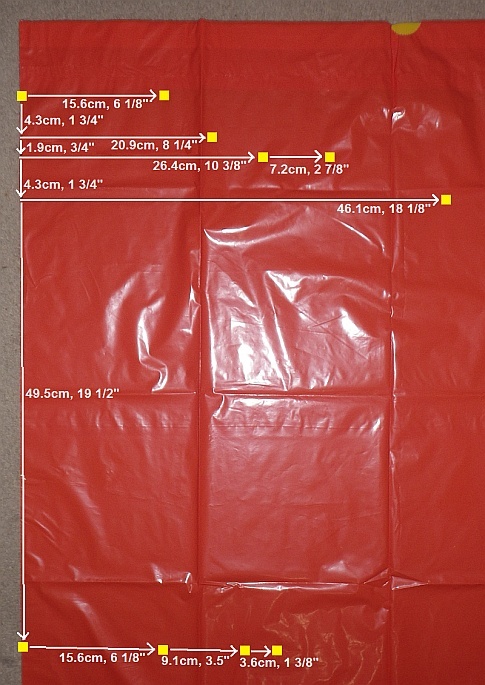 As before, place your plastic bag flat on the floor. In the case of plastic sheeting, fold it in half from left to right and run a sharp, straight crease down the left hand side. Just like you did for the sail, measure and mark dots on the plastic by following the arrows marked on the photo. Flip the plastic over and trace over all the black lines. As you did for the sail, open out the plastic and lay it flat. Now draw a line right down the middle, as shown in the photo up there. 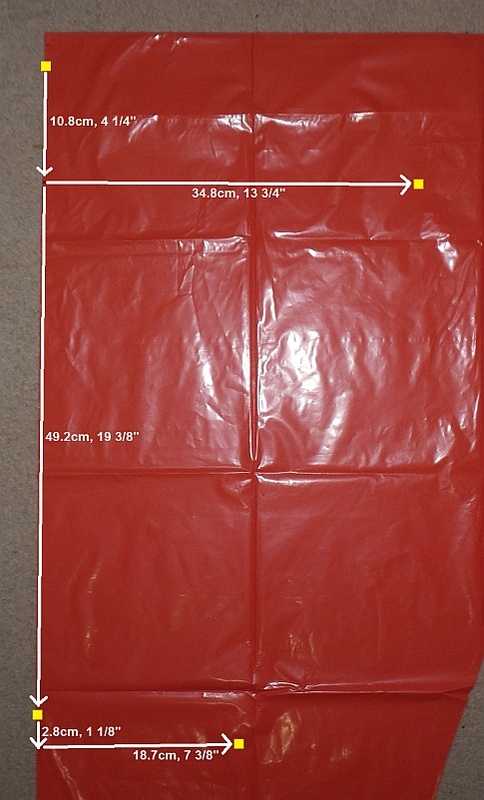 Lay packing tape along just the top edges of the cell plastic, as in the photo above. Let the tape overlap the black line by about a finger-width above the line. Take your scissors and cut along every black line, including the one down the middle. 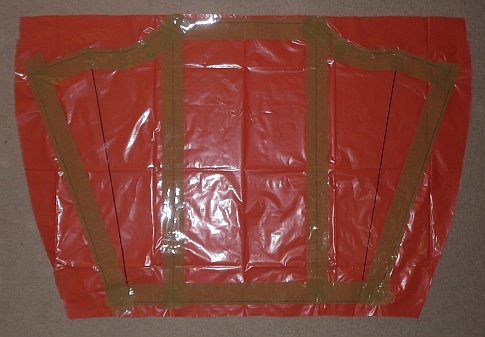 When you are finished, you will have the two cells as in the photo - ready to attach to the main sail. Take one piece of cell plastic and lay it over the sail, lining it up so it looks exactly like the photo up there. Or as close as possible, given that you are probably using slightly different plastic and tape. Run packing tape the entire length of the join, keeping it centered over the black line. Go straight over those little bits of sticky tape! 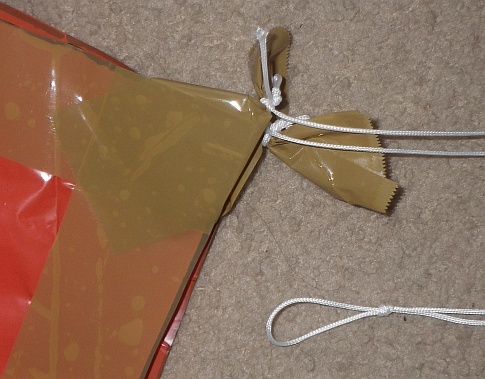 Trim the ends of the packing tape with scissors, so it lines up with the edges of the sail and cell plastic. See the photo above. 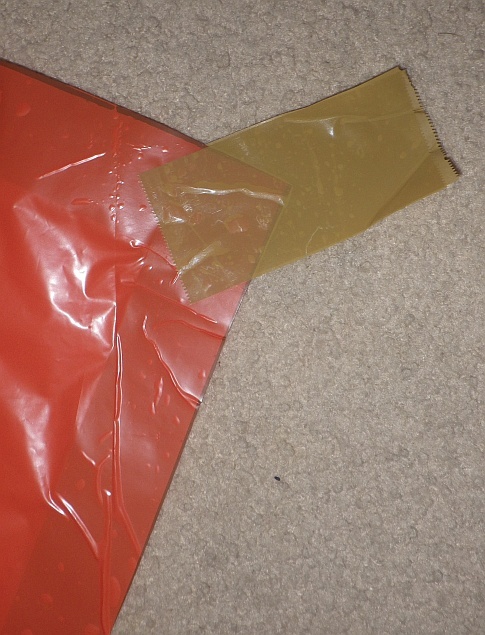 Flip the cell plastic up and fold it flat against the sail plastic, away from where it was before. Crease the join with your thumbnail so it stays down better. Now run packing tape the entire length of the cell, keeping it centered over the line as before. Cut off and trim at each end, so it looks like the photo up there. Line up the other long edge of the cell with the other black line, again tacking it in place with small bits of sticky tape. Run packing tape the entire length of the cell edge, and neaten it up at each end with scissors. As you can see in the photo, it looks like an inflatable cell now! This is hard to explain in words, so look very carefully at the close-up photo above. Your task is to pull off about a hand-width of packing tape and stick it down along the inside of the edge you taped in the previous step. Trim with scissors if necessary. The photo's too good isn't it - it shows every bubble, crease and inaccuracy! See if you can do better. Yep, you guessed right... Repeat all the above steps with the other piece of cell plastic. One cell is a mirror-image of the other, as in the photo. It's starting to look like a kite! 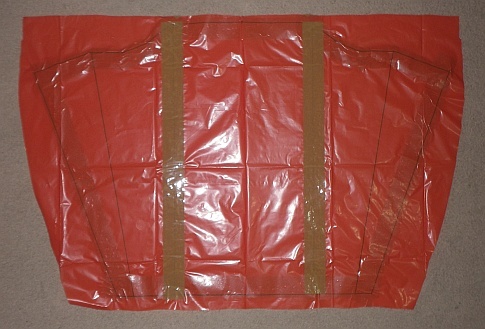 Place a 10cm (8") length of packing tape over one towing point corner of the sail as shown in the photo. Halfway between each edge of the sail corner. Also, half on and half off - but try not to let the 'off' bit stick to the floor or table-top! Flip the sail over and do your best to stick another similar piece of tape right over the first one. Press them together where they leave the plastic. See the close-up photo. You know what's coming... Go to the corresponding corner on the other side of the kite and do exactly the same thing, using 2 more strips of tape. There's the result below. All that remains is to attach the bridle! Cut off a 3 meter (10 feet) length of flying line. Tie one end of the line to one towing point tape of the kite, as in the photo. 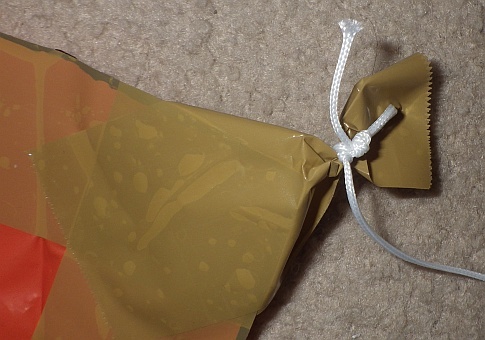 Use any knot you know but make it as tight as possible, to crush the tape *. It helps to fold the tape in half before winding the line around it. Similarly, tie the other end of the line to the other towing point. There they both are, in the photo below. 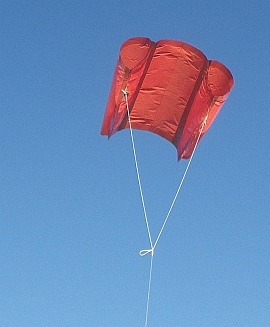 The photo shows the side of the kite which faces the flier, during flight. Nearly finished! 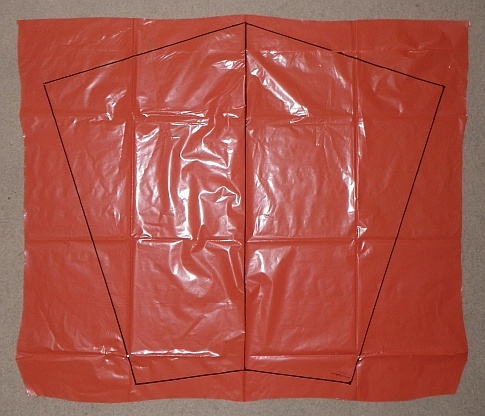 Lay the kite on the floor, folded in half so the towing points are perfectly lined up with each other. See the photo. Stretch out the bridle lines and tie a Simple Loop knot in, right near the end. The 2 bridle lines should be exactly the same length. I've brought the loop knot back into the photo above, so you can see it. All ready to take or stow somewhere! 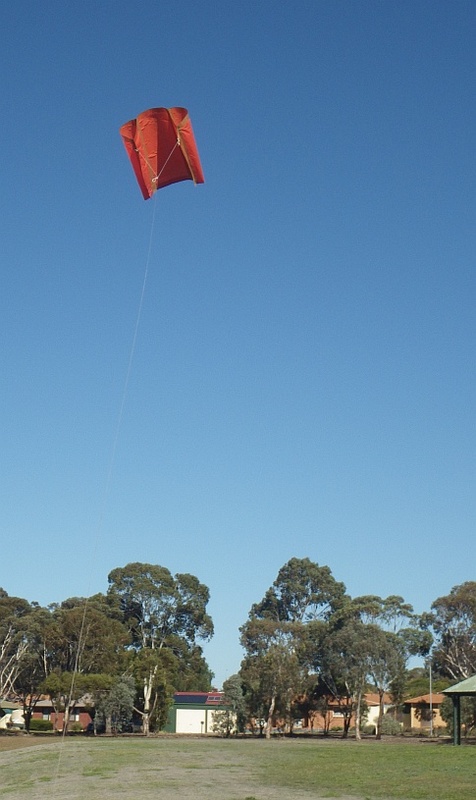 After unrolling the kite at a flying field, your flying line can be tied to the bridle loop. That's it, you're ready to fly. Alternatively, you can Lark's Head the flying line behind the loop knot. This makes it easier to attach the flying line and take it off again. Avoid flying in very windy weather. Tails are optional with this design. If you want to, tie a simple streamer through a hole near each lower corner of the sail. 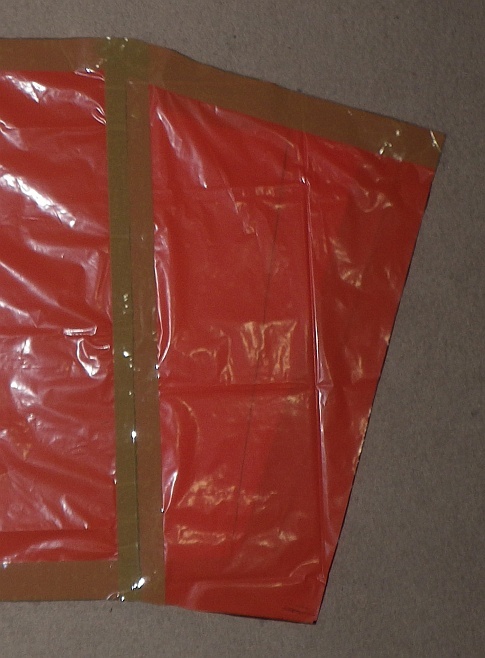 The packing tape border will prevent any further damage to the kite. 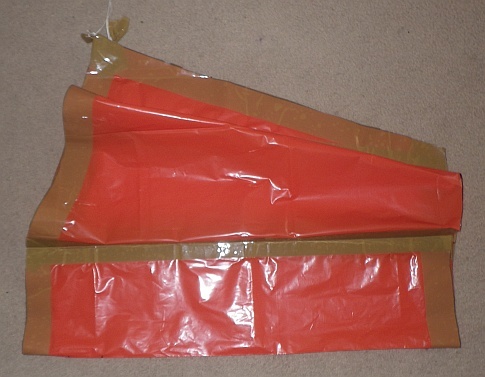 Hope you enjoyed learning how to make my Soft Sled kite! 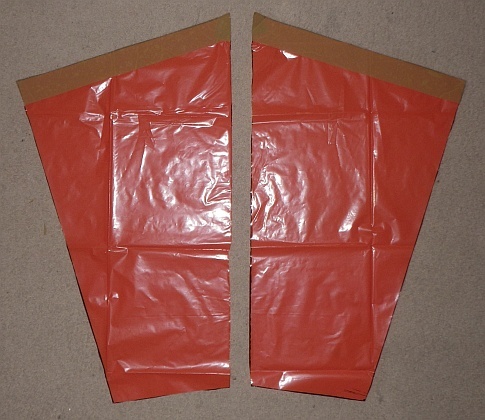 Consider using the e-book Making Soft Kites to try some other spar-less designs.